Spicy, floral, woody and rich with a robust mouthfeel. Toronto bartenders, Brent VanderVeen and Frankie Solarik are known for their attention to detail. 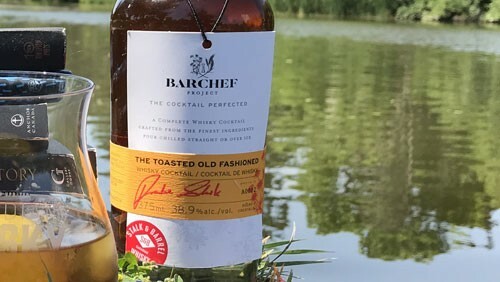 Barry Stein and Barry Bernstein are the pioneering Toronto distillers who have introduced a new rye-whisky flavour spectrum, and thus new meaning to 100% rye whisky. Together, they have come up with a BarChef Project Old-Fashioned that brings new credibility to bottled cocktails. But a good part of the enjoyment of a cocktail comes from watching it made and served. So, why would two top bartenders even dream of batching cocktails for sale by the bottle at liquor stores? Well, possibly because those of us who plan to abandon the bars and sit outside with our summer reading still want to be sipping something better than Sangria. It turns out that attention to detail using premium ingredients is easy to detect even when your Old-Fashioned is poured from a bottle. Stalk & Barrel Red Blend Canadian whisky is the base, with maple syrup as the sweetener and toasted chamomile as the signature spice. We suggest ice cubes, or better yet a single large ice cube and a slice of lemon peel to garnish this spicy, woody beauty with its touches of something anise. BarChef Old-Fashioned is bottled at 38.9% and a 375 ml bottle serves 6 cocktails. Now, pour one, grab what’s next on your summer reading list, head down to water’s edge, put your feet up, and sip in peace. DAVIN DE KERGOMMEAUX is the author of Canadian Whisky: The Portable Expert, the definitive guide to Canadian whisky. An independent whisky expert, de Kergommeaux has been writing about, talking about, and teaching about whisky for more than fifteen years. His writing and tasting notes appear in various whisky and lifestyle magazines. His book, Canadian Whisky: The Portable Expert was published by McClelland & Stewart in May 2012, and is distributed in Canada and the U.S. by Random House. De Kergommeaux has also contributed to or co-authored three other books about whisky. De Kergommeaux is often asked to judge at international whisky competitions, including the World Whisky Awards. Since 2003, he has served as a judge for the annual Malt Maniacs Awards and is also the founder, head judge and co-ordinator for the Canadian Whisky Awards.